Arabs claim they found the arsonist from Duma - except he has been in jail since last December; family plans to sue over dangerous framing. Palestinian Arab social media has been quickly spreading a claim that a specific Jewish arsonist was behind the lethal fire in the Samaria village of Duma last Friday - except the "culprit" they found has been sitting in an Israeli jail since last December. An announcement has been spreading around influential Palestinian Arab Facebook pages claiming that Yehuda Landsberg of Gilad Farm in Samaria committed the arson that killed an Arab infant and wounded four family members, reports Channel 10 on Monday. The announcement includes a poster image with Landsberg's picture, and the word "wanted" in English, Arabic, and Hebrew - with a clear Google Translate-inducted mistake in the Hebrew reading ratziti, meaning "I wanted," instead of the correct mevukash. There's just one problem: Landsberg has been in jail since last December serving a two-and-a-half year sentence, on charges of having committed "Price Tag" vandalism on the Arab village of Far'ata. 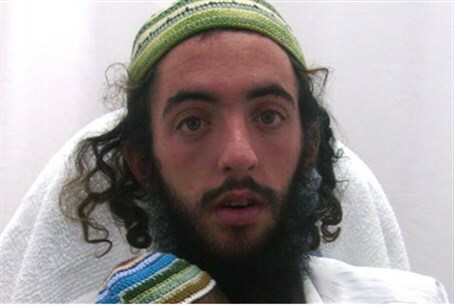 According to the indictment against Landsberg, he and two others tried and failed to set some planks on fire at the site of a new home being built in a nearby Arab village, and then went to Far'ata where they ignited a Volvo and a Mercedes, tagged the scene with Star of David graffiti, and returned to Gilad Farm. Responding to the false Arab charges, Landsberg's brother Hillel told Channel 10 that "the feeling is that someone is trying to harm us and our family, in the way they're determining that someone from our side has some sort of part in this awful act that was committed." Skeptical reports have referred to the various questionable aspects of claims that Jews committed the arson attack in Duma, such as the fact that the attackers picked a house in the center of the village, and first burned another house before setting the family's house on fire, waiting around to keep the parents there, and write elaborate Hebrew graffiti. It is unlikely that Jews could carry all this out without being caught by Arab residents, according to these skeptics. "We currently view this as absolute incitement that endangers the lives of the family members, and we intend to submit lawsuits against those who decided to post this libel," declared Hillel. Landsberg's lawyers have claimed he was mistreated in custody and denied legal access for prolonged periods. At one point, Landsberg - who is father to three disabled children - started a hunger strike after reportedly undergoing harassment at the hands of police, which included the playing of recordings of his children crying. Politicians were quick to label the Duma arson a "Price Tag" attack, in reference to incidents of nationalistically-motivated criminal damage against Arab-owned property by Jewish extremists, often in revenge for deadly Arab terrorist attacks. Evidence has also surfaced in several cases showing how local Arabs often stage "price tag" attacks to frame Jewish residents, and Arab residents likewise falsely blamed Jews for a mosque fire in a shocking libel last November.